The Kidoozie Little Doctor Kit has everything your little doctor needs for house calls! 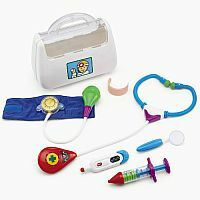 This 7 piece set features a stethoscope, a blood pressure cuff where the gauge moves when pumped, and a thermometer which clicks and changes temperatures. There also is a spueaking syringe, a laryngoscope and pretend plastic bandage that is easy on and off. 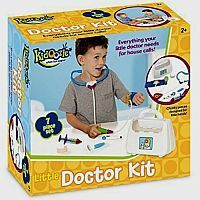 Playing doctor has never been more fun for toddlers. Everything fits in the snap to close, sturdy doctor bag. Measures approximately: 8.75 x 7.50 x 3.75 inches..